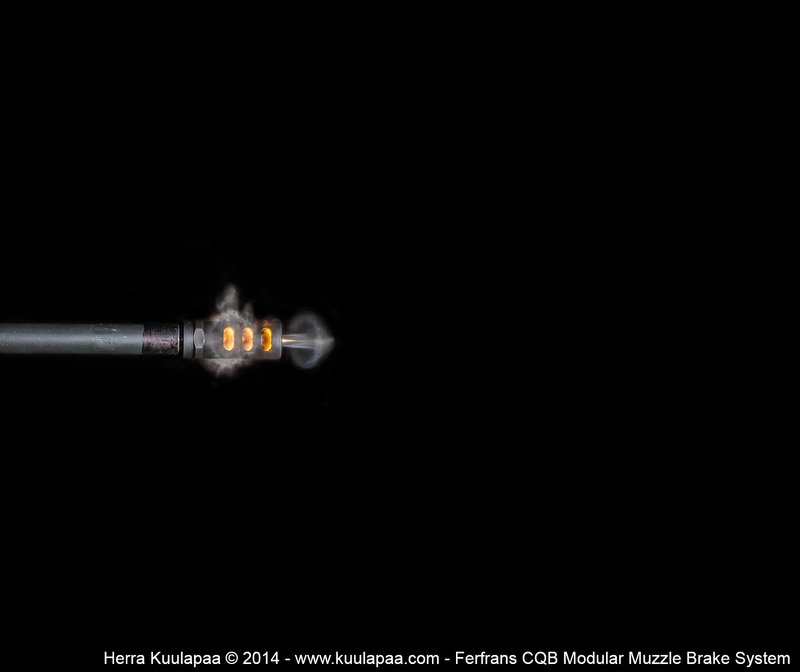 This is the Ferfrans CQB modular muzzle brake system, which is a novel concept featuring both conventional muzzle brake but also something that Ferfrans calls a concussion reduction device or CRD as abbreviated. 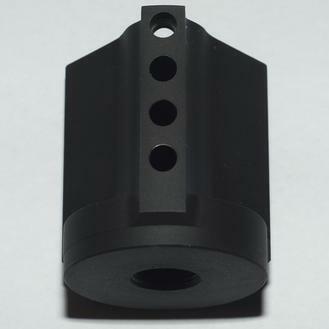 CRD function is a quickly attachable/detachable shield with small holes in it and it works directing muzzle blast forward but also let some gas escape through the shield. This reduces effectively both backward recoil and side blast effect. 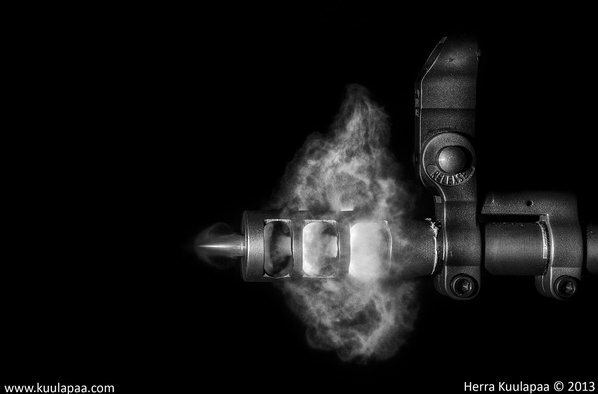 It also reduces muzzle blast felt by shooter. 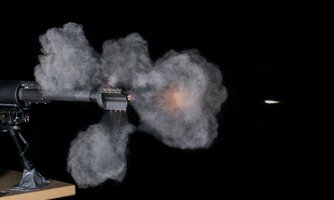 We put the CQB into indoors test while taking these pictures and I must once again say that shooting compensated AR-15 indoors with Nato spec rounds is not the most enjoyable thing to do. Especially for me behind the cameras it was simply terrifying and the blast really beat me up good. 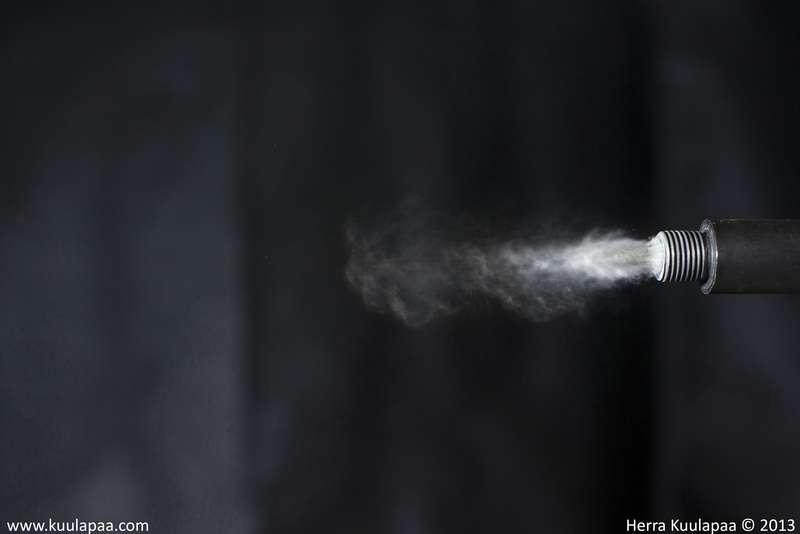 When we attached CRD the blast effect was greatly reduced and it was tolerable without the blast banging my nasal cavities and loosening the tooth fillings. 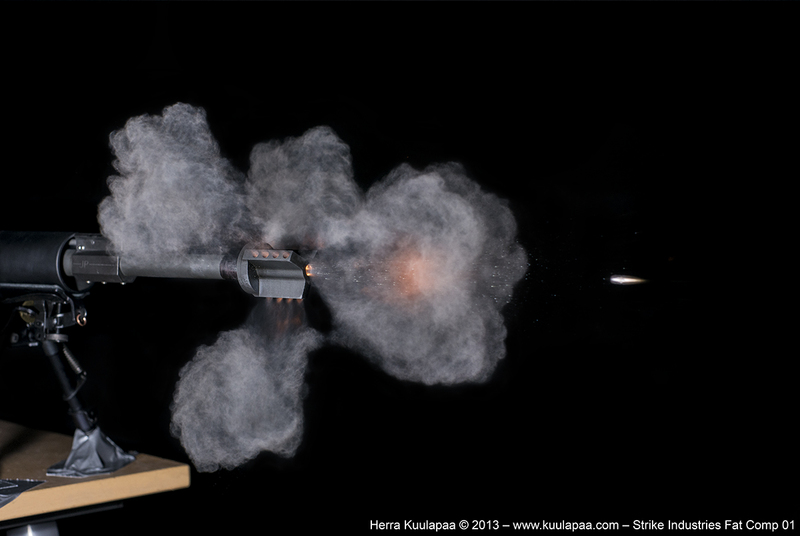 -Stereoscopic 3D pictures of both options, I encourage you to view these as they provide so much more information about the three dimensional blast formation. With the brake option the blast distribution is comparable to both previous Japan Type89 and Checkmate comps. With CRD attached the blast is rendered to very different. 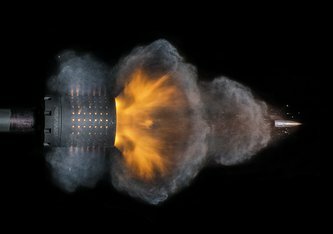 Some of the gas is let through CRD shield reducing forward blast velocity. I have no method to measure forward directed gas velocity but I’d expect it to be reduced because most of the gas flows though brake chambers and then redirects its path by CRD shield while some is let through the shield on the way. 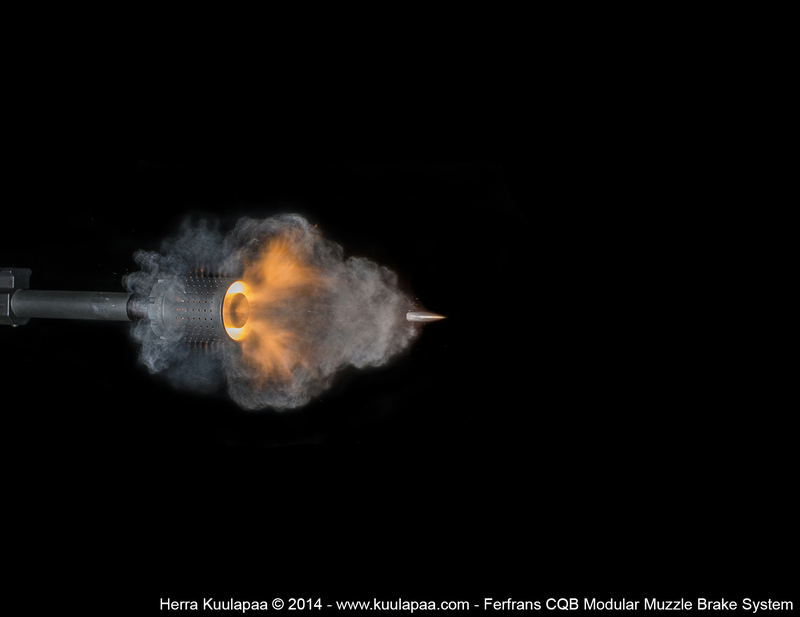 Ferfrans CQB is a novel concept bringing increased comfort to shooters next to you and it’s interesting to see how it works at range. 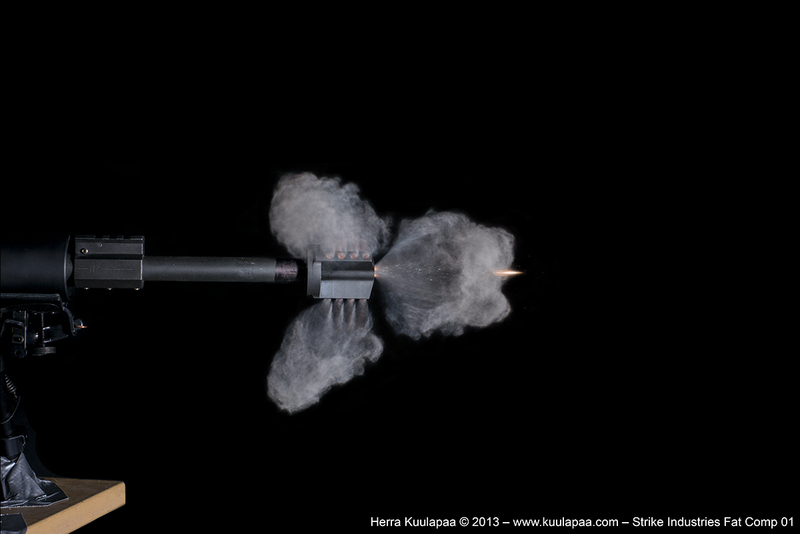 I personally shoot often on ranges with dusty concrete floors and flying dust is sometimes pretty annoying. This should be a partial cure to that. This is the third part of Strike Industries comp project and this time we introduce you Checkmate comp. 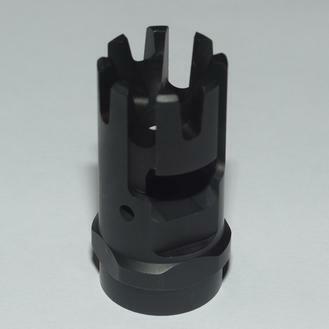 It's a one chamber AR-15 comp with a crown type flash hider. Structurally it resembles more traditional comps and Type89 photographed below than FAT comp 01. 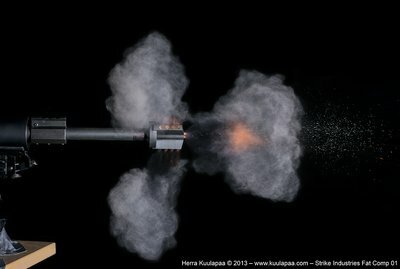 Side blast can be compared to Type89 comp but form of the blast is slightly rounder. 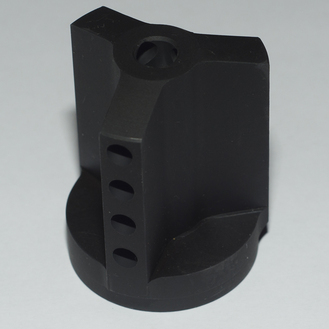 It may be because chamber volume is larger in checkmate although there is one of them. 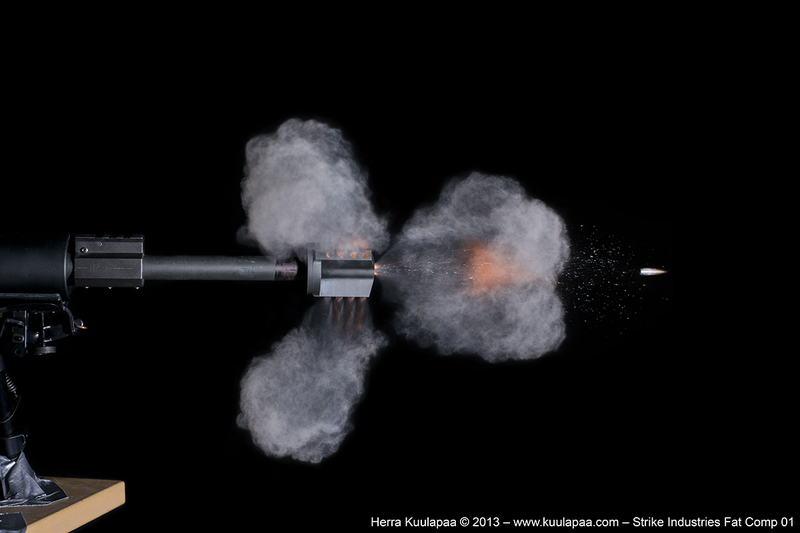 In stereoscopic 3D and forward angle images can be seen that comp directs muzzle blast to sides very effectively. There is however a little bit bigger forward blast than in Type89 but not much. Most likely this is because comp is shorter and it has less chambers than Type89. Overall I'd estimate both comps to be quite alike in real life. At the moment we have no means quatify recoil effect but hopefully we get opportunity to study also that. Stereoscopic 3D pairs are available below. I'd recommend everyone try to view them. They raise the high speed picture experience to whole another level! This is the second part of Strike Industries comp project and this time we introduce you Fat comp 01. It is a three port comp; two sectors directing gas up to both sides and one down. 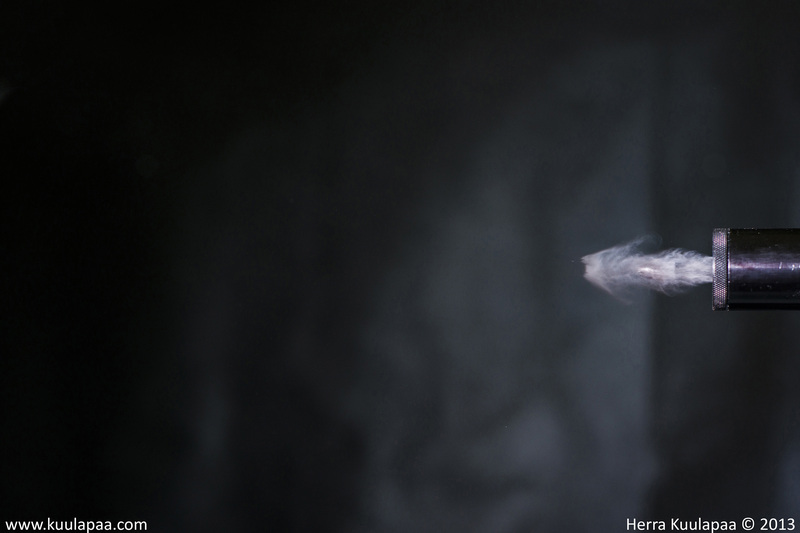 There are four holes in every fin and they're tilted slightly backwards to compensate recoil. 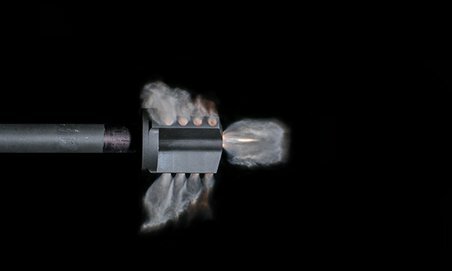 Open chambers of Type89 comp directs the blast to sides very straight and effectively while Fat comp 01 administers gas along the longer and narrower channels and this may make the difference in blast effect. 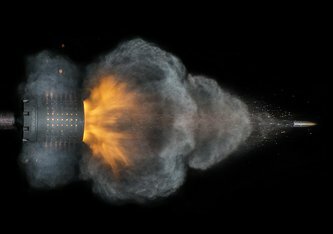 This effect is best seen in the first pictures of both side and front angle series where bullet is still inside of the comp or barely left it. First holes from the rear are venting gas and it gradually decreases towards to the tip of the comp. - just like you'd expect to happen. There are some interesting differences between Japan Type89 comp and Fat comp 01. First is of course that already mentioned side blast intensity. Japan Type89 comp makes two very large blast formations on both sides of the comp and Fat comp 01 forms three rounder blasts. 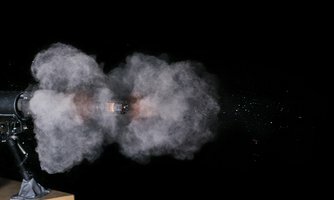 I cannot measure pressure or quantify blasts but I’d make an educated guess that rounder and longer shapes mean slightly lower overall pressure and longer push like gas streams. Also front blast is different between the comps. 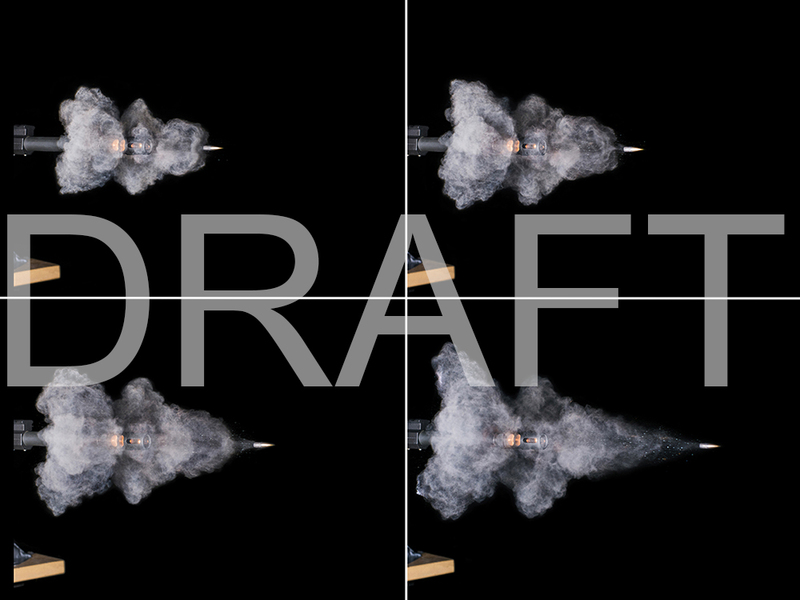 There is a round and almost uncompensated looking front blast formation with Fat comp 01 and more streamlined arrow type flow with Japan Type89 comp. It means that there is more gas directing forward with Fat comp 01. 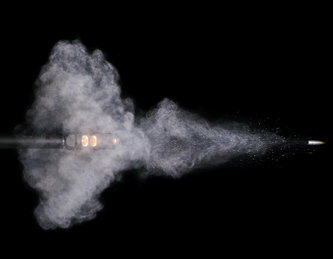 It’s however important to remember that although Fat comp 01 front blast looks like uncompensated barrel it actually isn’t such because major amount of high pressure gas has already been directed to sideways and the bubble like cloud is made by only partial amount of gas with perhaps reduced pressure when compared to uncompensated barrel. Similarity is interesting though. Fat comp 01 felt not so loud (indoors) like the previously studied Japan Type89 comp. Quite interesting comp I'd say. 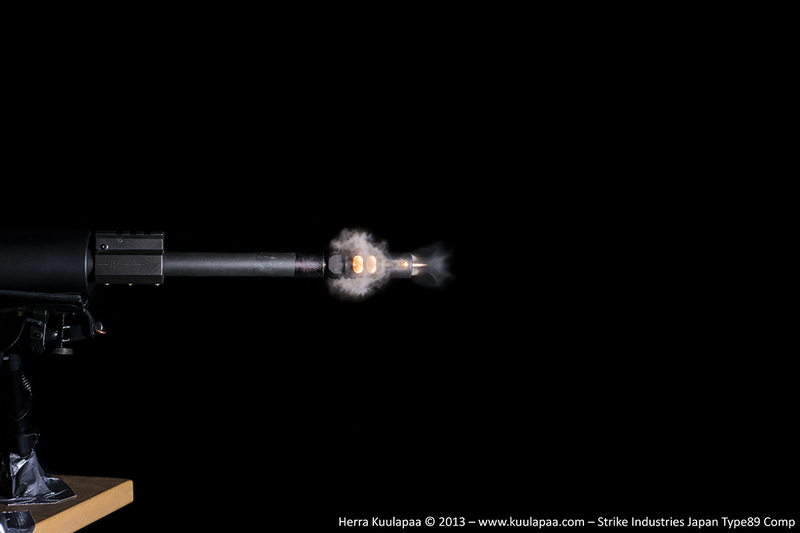 This is the first part of Strike Industries comp project. 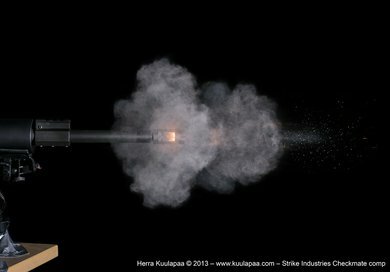 Background is that some time ago we received AR-15 comps to be photographed from weapons accessories company called Strike Industries. We have first comp data set ready and that is called Japan Type89 Comp (J-COMP). 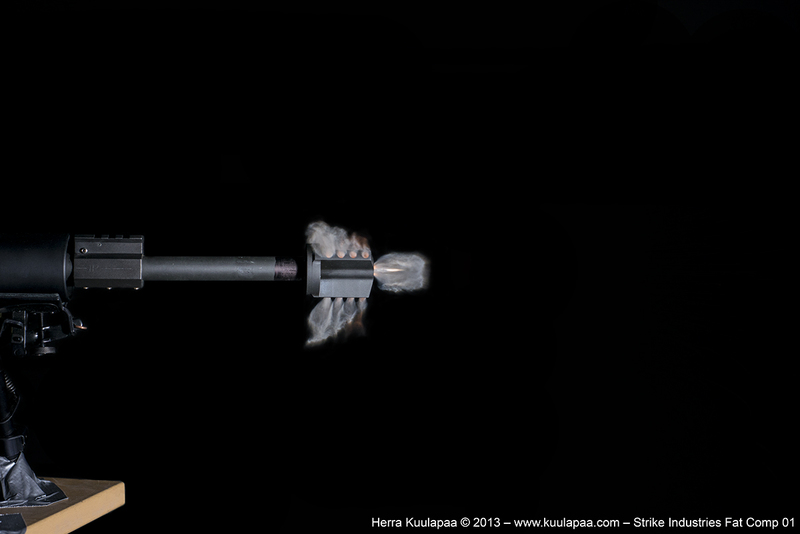 It’s based on Japanese Howa type-89 assault rifle comp / flash hider. This comp has three chambers, two standard vertical comp chambers and one front open horizontal chamber. 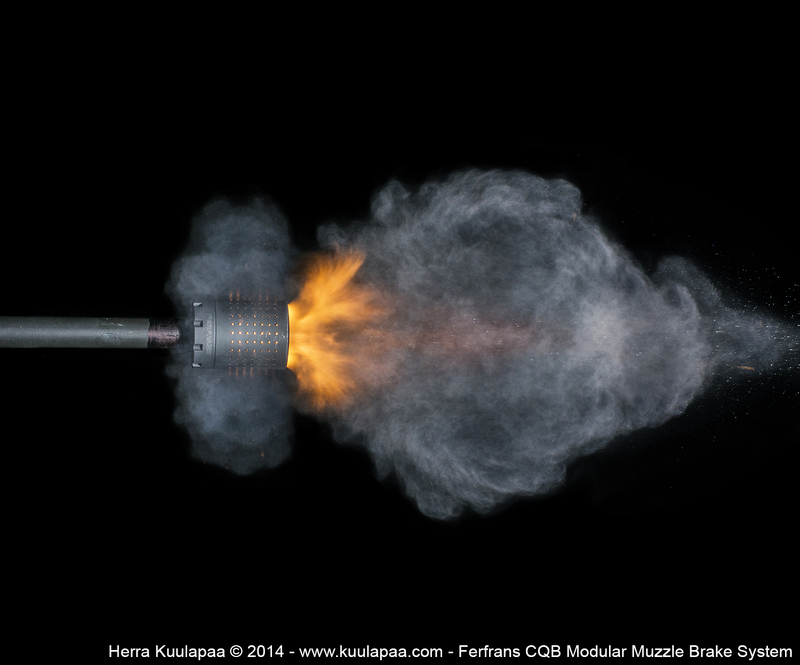 Idea is to reduce both recoil and muzzle flash. We have three type of pictures of this comp. Set from the right hand side and front angle. As a bonus there is a stereoscopic 3D material to help you really see how blast formation has formed. Due to recent photo thefts and copyright violations we're forced to reduce online picture size. This is very unfotunate. Note that even these pictures are freely viewed on this site the material is fully copyrighted. Please contact us if you wish to use this material on your website, print format, commercially or just recreationally on your wall, we’d be happy to discuss and help you. 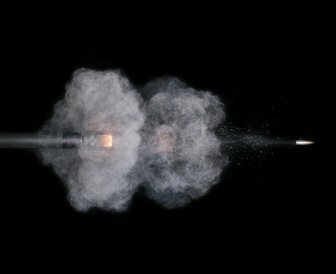 Main purpose of this site is to provide interesting material and information for shooting community. Let’s get started! 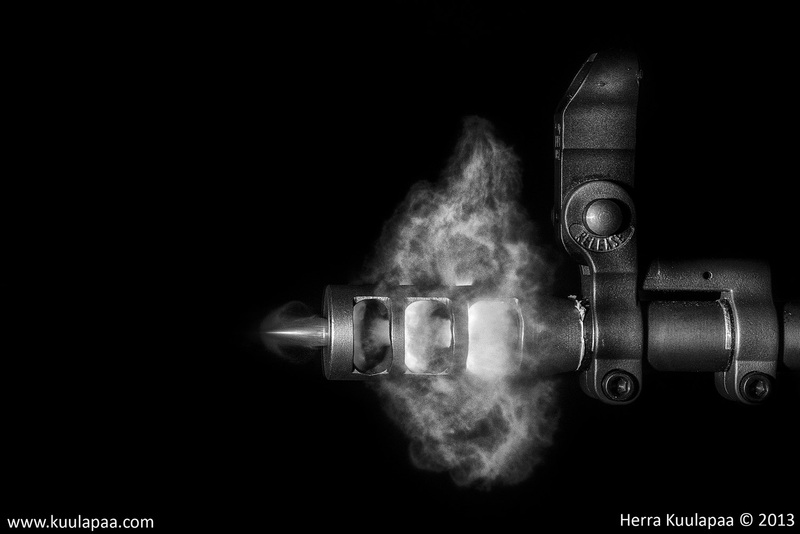 In the first action picture above you can see interesting moment of comp function; bullet is just leaving the comp and high pressure gas is rushing out of the comp chambers. There is also gas rushing ahead of bullet. In second image bullet has exited comp and leaving blast cloud behind. 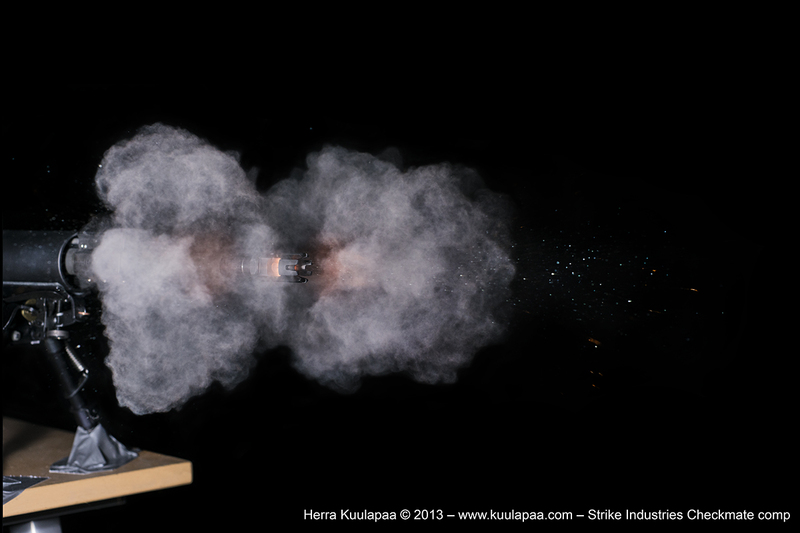 Gas velocity has already started to decrease and more gas is pouring out of the comp holes. Blast formation is very typical for comp and you can see clear effect compared to uncompensated barrel below. 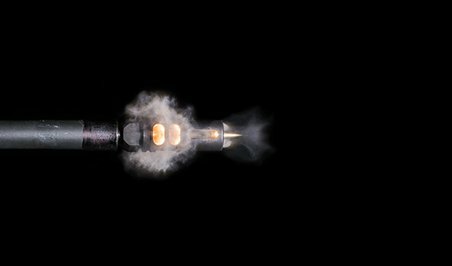 There is some gas rushing forwards but only fraction of the pressure is now pushing rifle backwards compared to uncompensated barrel. 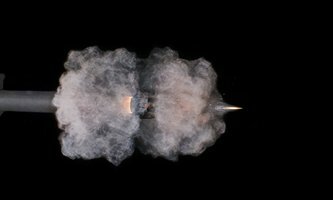 In following pictures cone like side port blast continues expanding and there is average size gas trail after flying bullet. Side image shows triangle like profile but we need to remember three dimensional shape of it. Shape of the blast is best visible in stereoscopic 3D pairs below. Ps. 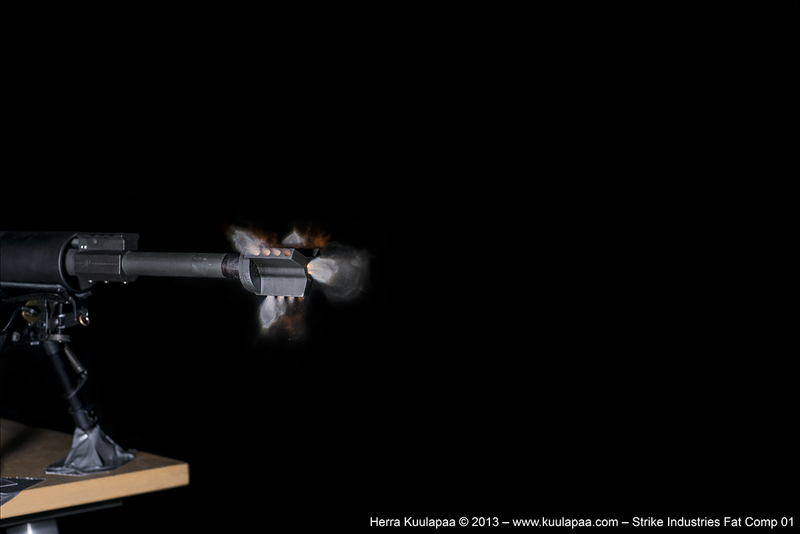 We got a great idea for AR-15 shooters Christmas present. Decorate your wall with these or give as a present! Pictures are very high resolution (70MP) and you can make quite big prints out of them if you like :) Note that there is no table visible in final images. Contact details on about-page right upper corner. 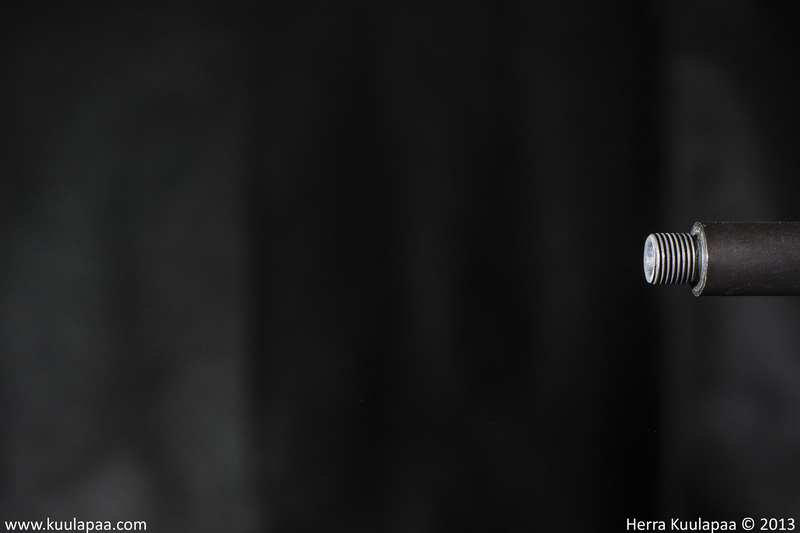 This time I'll have some very interesting stuff to show you. Around a month ago I was contacted by Strike Industries a US based firearm accessories company. 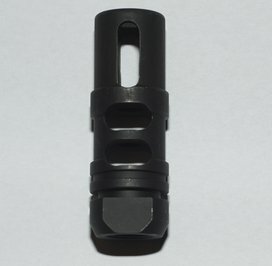 They asked if I liked to photograph some of their AR-15 compensators and I of course replied: Yes, I do. Here were now. Base line done below and what is coming in next couple of weeks are the results of tests. 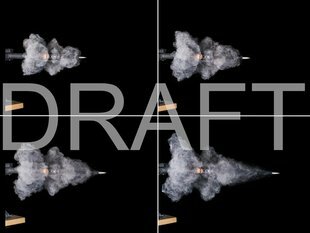 It has been several months since we shot AR-15 last time (in front of camera of course) and now it is time to return into this subject. 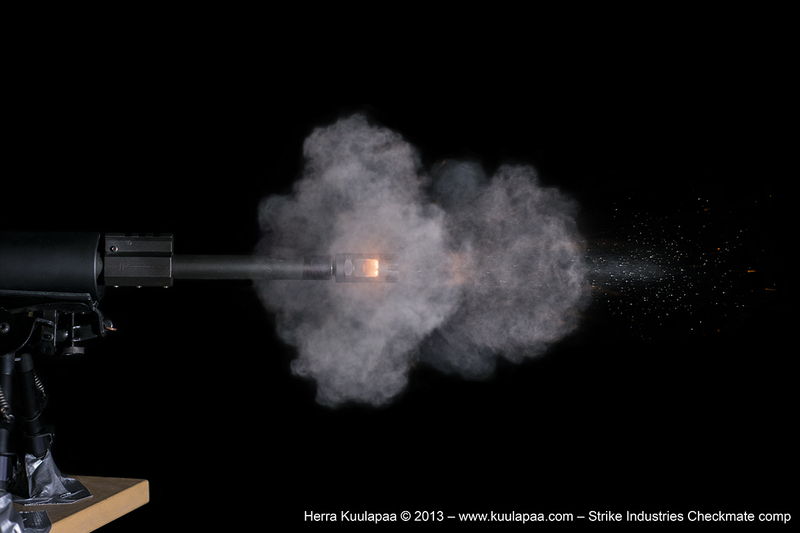 What we didn't do last time was to shoot it without any brake/muzzle flash hider. 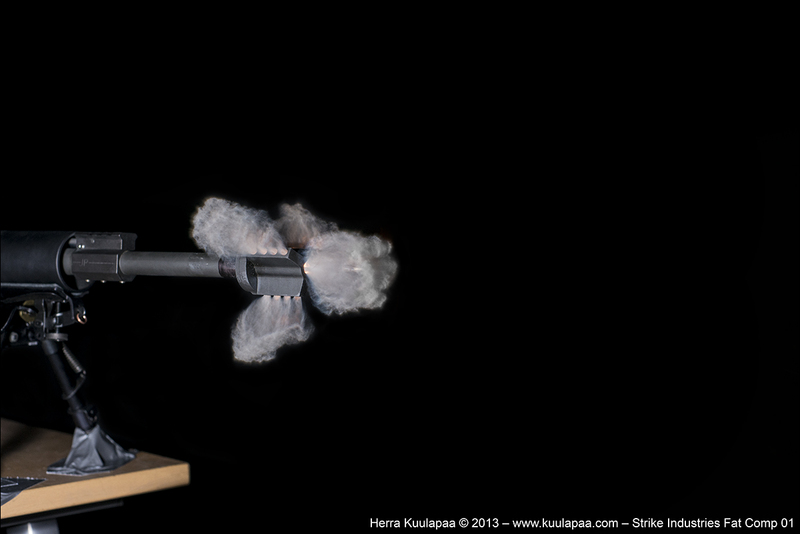 Reason for this session was to make a base line for future AR-15 test. It's really interesting how much happens in so brief moment of time. All these pictures fit inside of 500µs time frame. They're from separate shot of course but symmetry in them is simply fascinating. 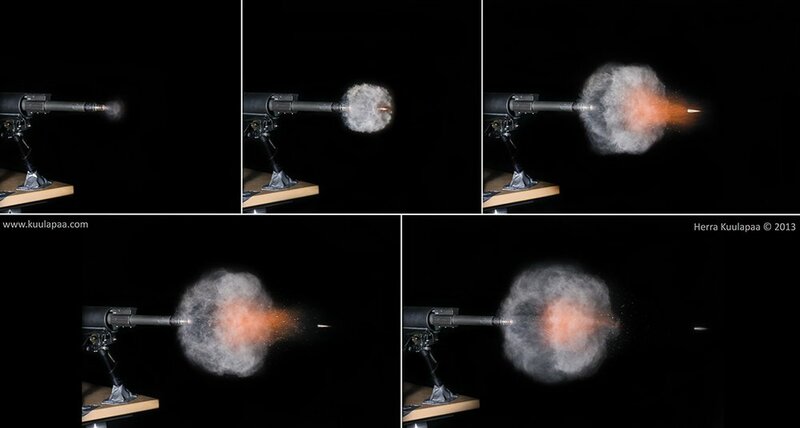 All of you who shoot with AR-15 know how fast it cycles and to put these pictures into perspective I like to point out that in these pictures the bolt hasn't even moved yet. You really can't see these things with naked eye. 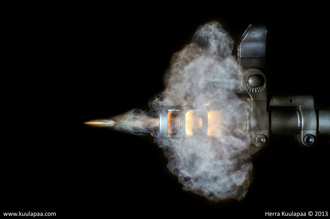 Pressure blast coming out of the barrel is directed forwards. This of course makes gun to recoil. Interestingly gas doesn't flow very far like it does in .308 pictures below. 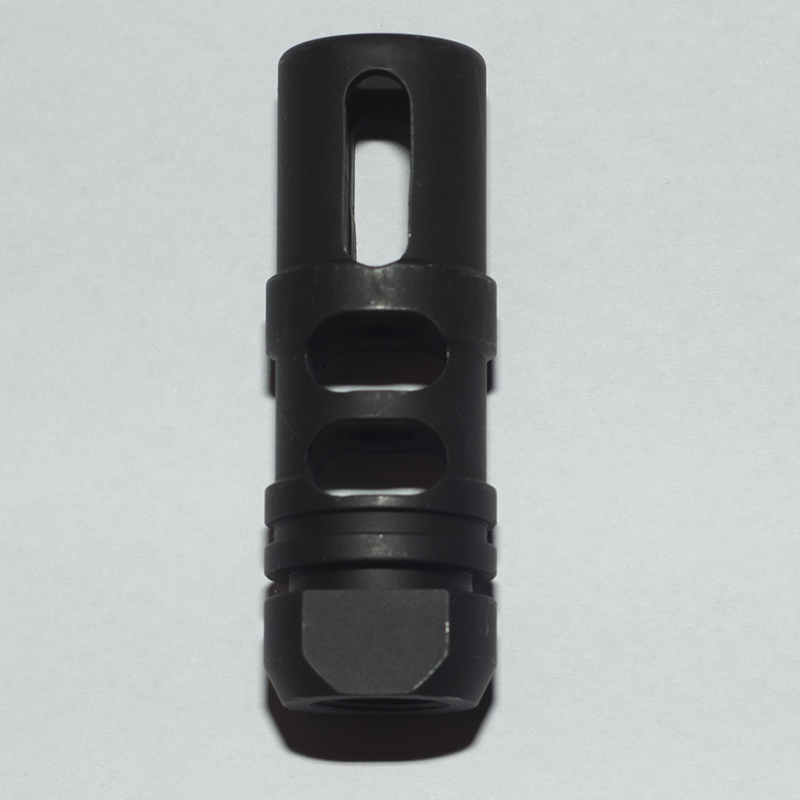 Instead it stays as a nice round'ish ball at the muzzle. Maybe the amount of gas is the limiting factor in .223Rem. 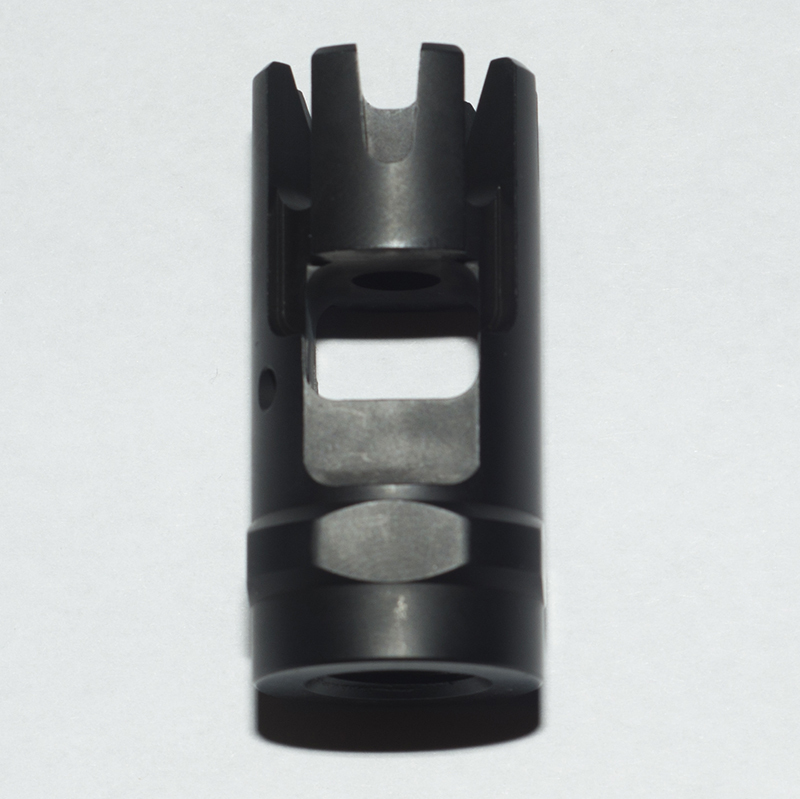 Here is second AR-15 rifle muzzle brake picture series. And this time I can really call it series. But why to do second one you may ask? Well, because this ain't .223Rem anymore but Colt 7.62x39. 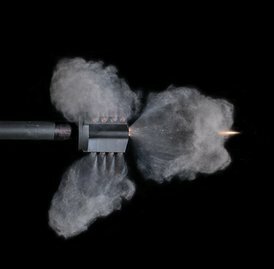 So we're talking about heavier bullet and slower muzzle velocity. 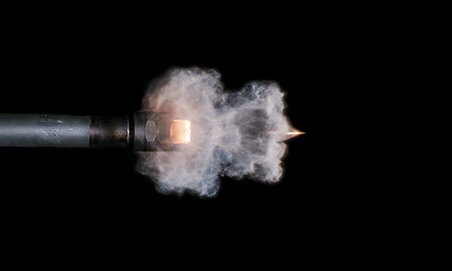 Bullet is 128 gr copper jacket full lead core. 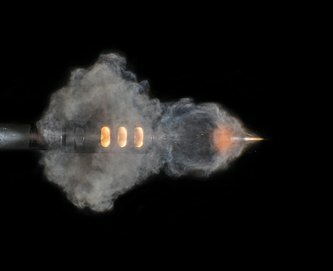 Actually bullet diameter is .310 rather than .308 so rifles bite it better. 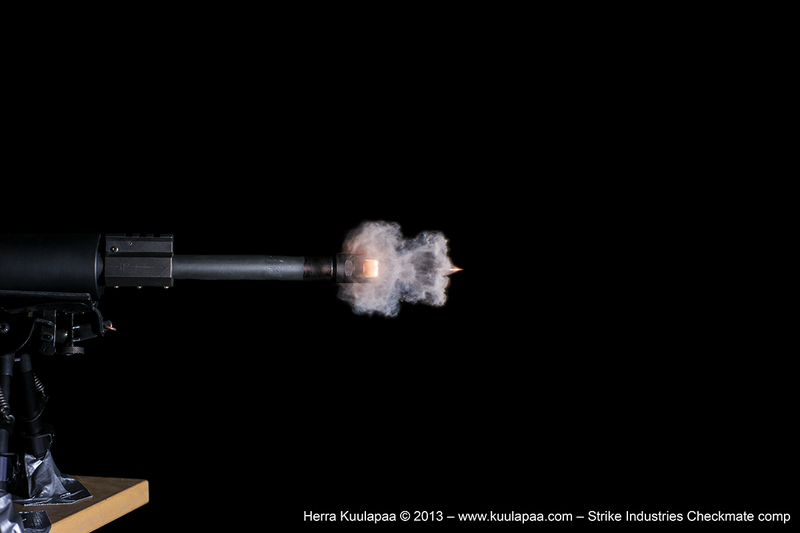 Barrel is 1:12 twist and soft copper jacketed .310 bullet functions really nicely with rather gentle rise. 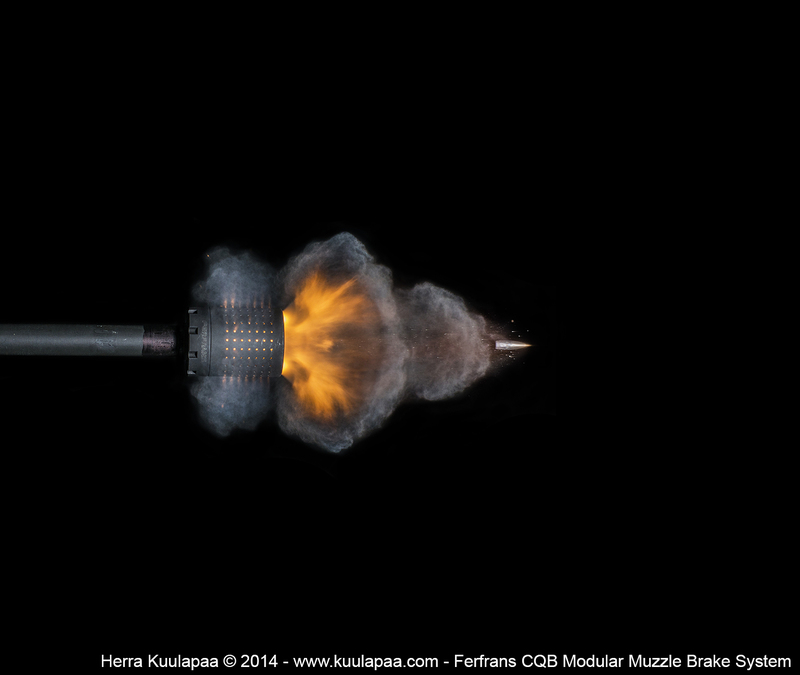 Bullets are remaining stock of late Finnish bullet maker Archipelago. 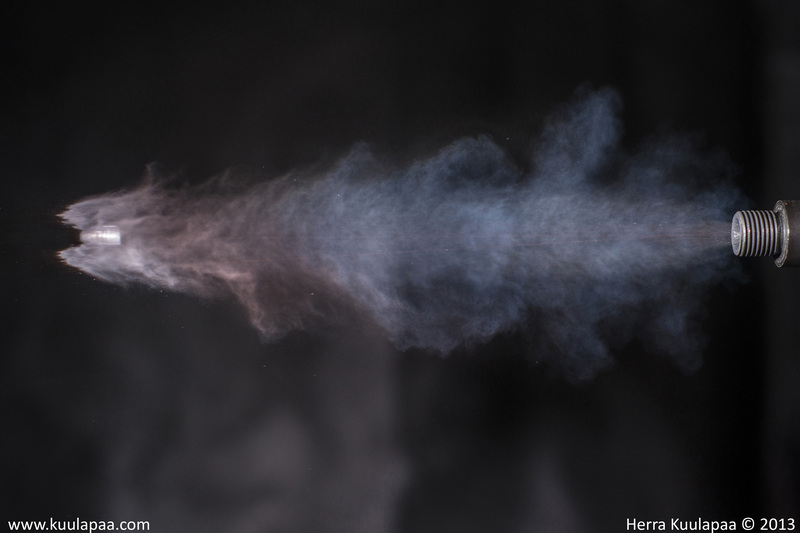 Let's start with gas cloud. 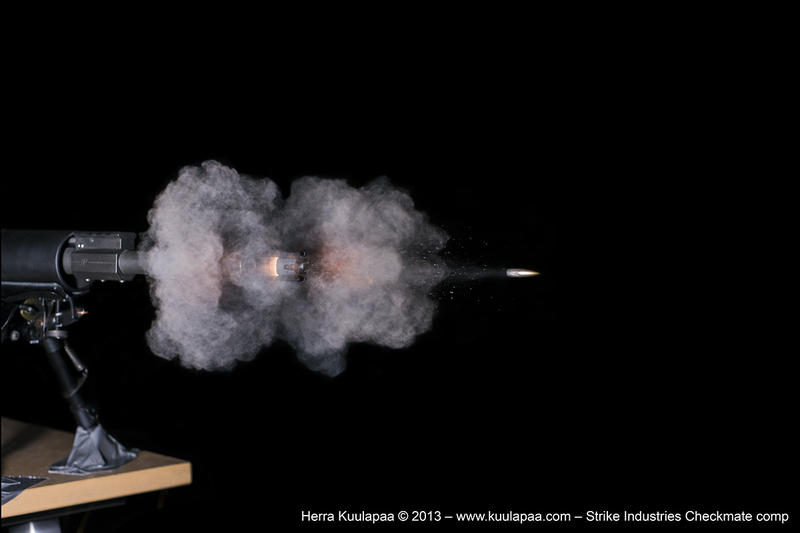 Powder used with 7.62x39 was Vihtavuori N130 while .223Rem test had higher energy density Vihtavuori N540. Usually 7.62x39 is reloaded with Vihtavuori N120 type powder but I some reason like N130 better. 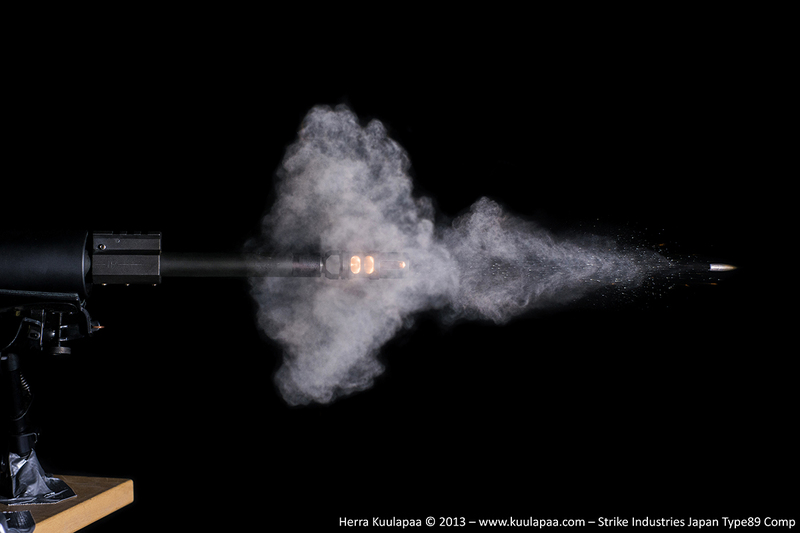 It has one drawback though and that is visible as particle discharge following bullet. 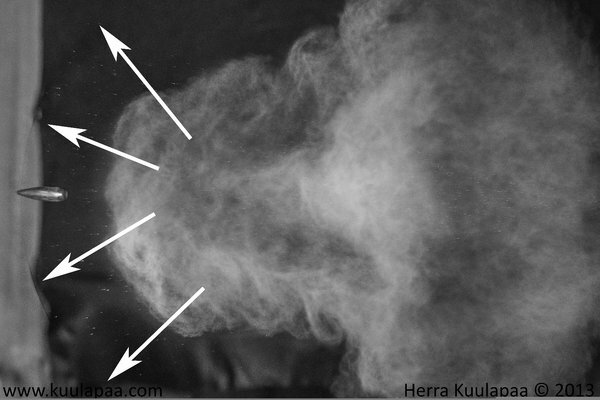 That indicates that whole load is not properly combusted and powder is lost, which can lead to pressure/speed variance. 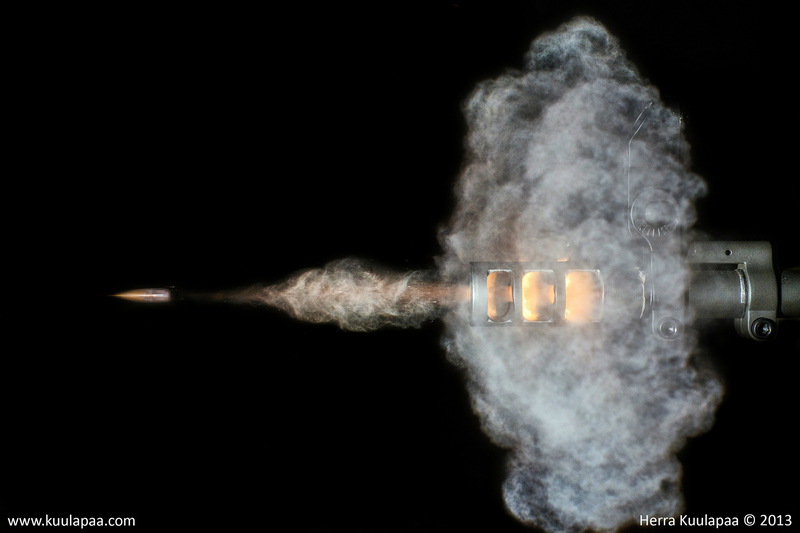 Maybe I need to adjust my load or change to faster burn rate powder. 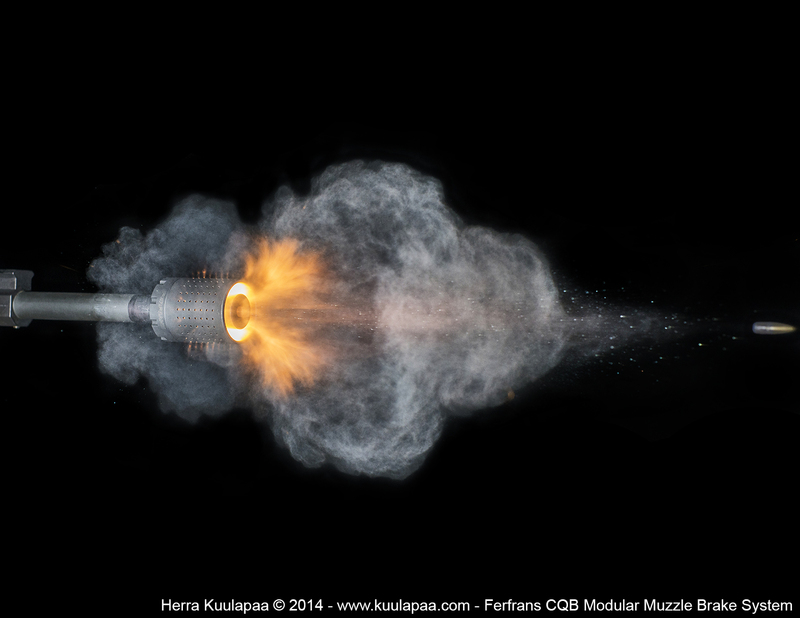 Muzzle velocity was not measured but according reloading data it was approx 700 m/s or 2300 fps. 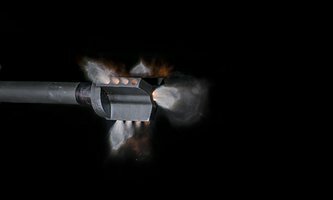 Comparing these two cases is of course difficult and rather subjective than objective but I'd estimate that 7.62x39 brake is directing more gas forwards. 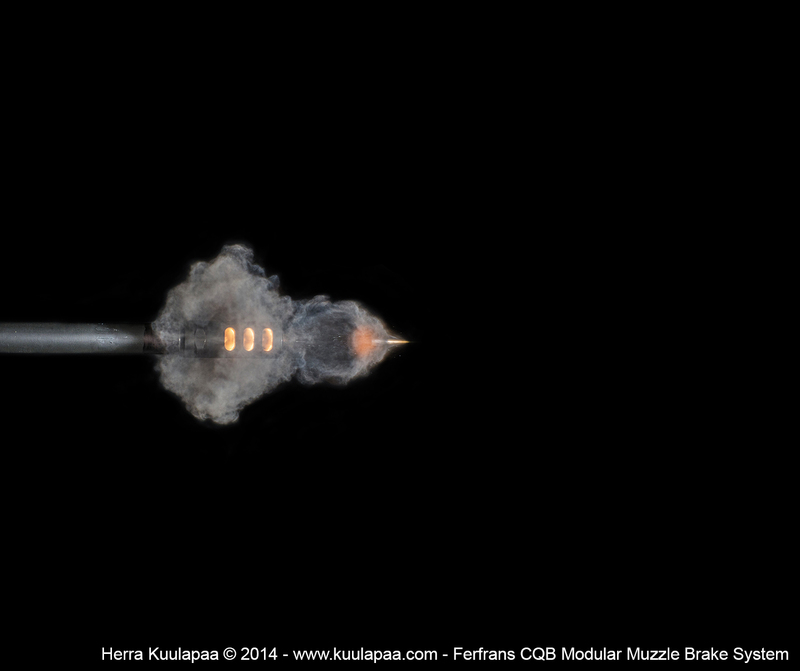 This is however expected due to bigger bullet diameter and different brake structure. I'd guess that higher pressure of .223Rem makes it better suitable for compensator use than 7.62x39. I must make remark though that Colt 7.62x39 high very good to shoot with and practically there is very small difference of feeling to .223Rem. This time I haven't got anything new stuff for you but something from a bit different point of view. You can see that this is actually same image than below but it's same time one of the most beautiful ones in all simplicity. 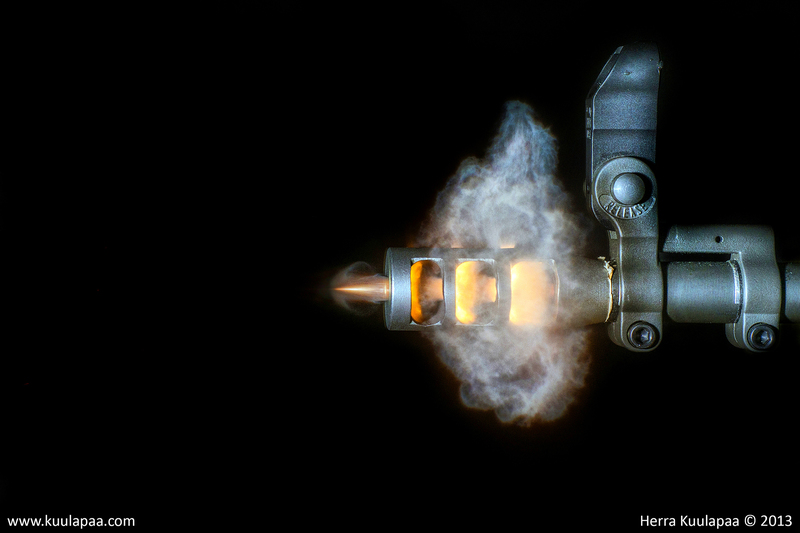 Just minimal amount of gas flowing out of the brake bullet just about to exit as well. Sometimes stuff just looks better black and white. It could be just me though. What do you think? 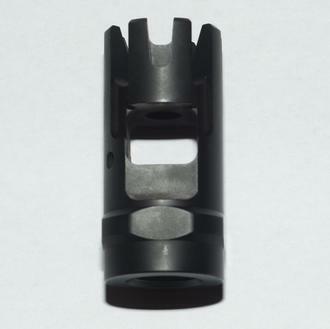 Next I'd though to bring you more of AR brake material but a bit different: About Colt 7.62x39, which is one of my treasures. Finally we got into subject: AR-15. This is something I've wanted to do for very long time. Plan goes back seven years to 2006 but back then we got no resources or equipment to do this. But now we do and here is what we can do. It's important to remember that even though results are as nice they are this is in the end just concept test with AR-15 type weapons. Setting up this test took some careful planning and for a while it looked unlike to get everything and everybody together right time and place. It did work out though and I think we really succeeded. What we did do then? Weapon is AR-15 chambered 5.56 NATO and I don't think it needs any further introduction. 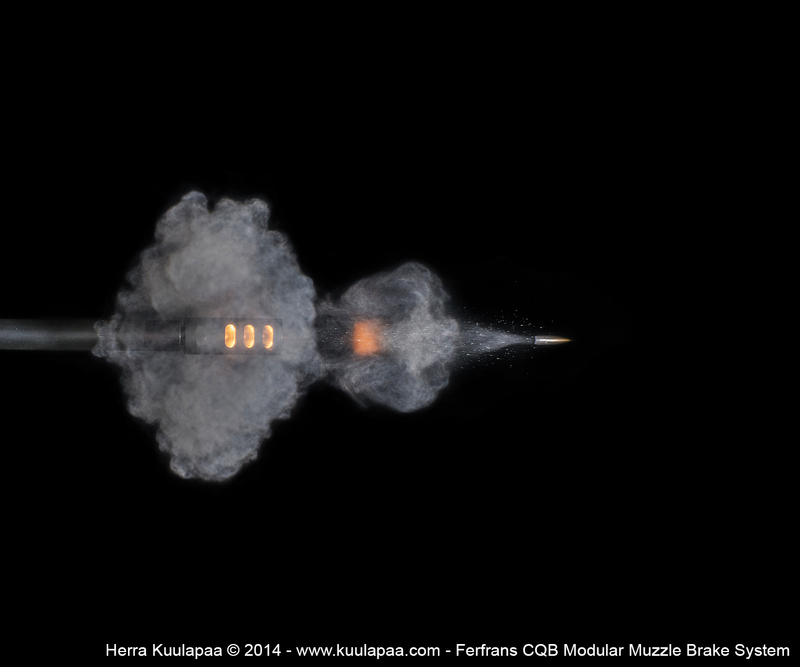 Plan was to illustrate how muzzle brake directs gas and how early stage bullet ballistics look like. 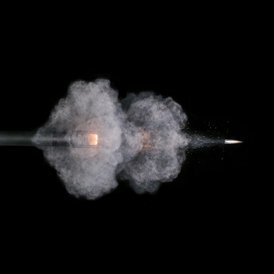 Ammunition used was standard 5.56 M193 55gr FMJ and that longer bullet is self loaded cartridge with Hornady 75gr BTHP Match. Why? 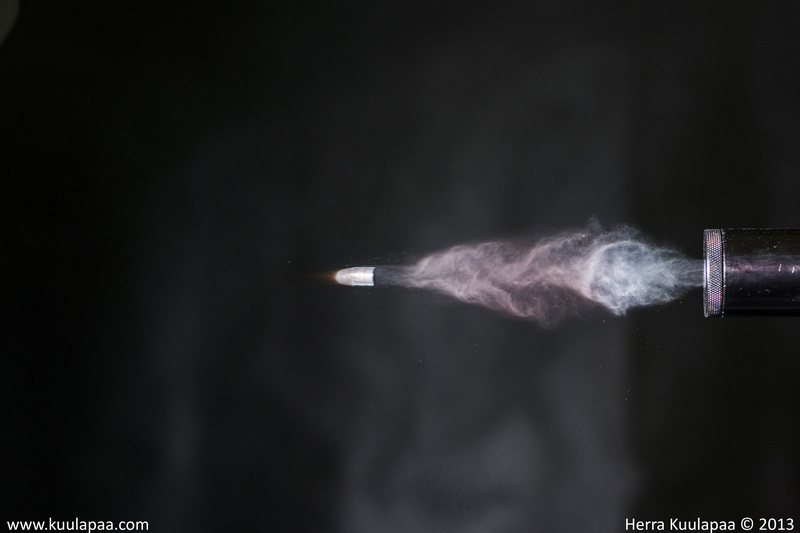 because that 75gr Hornady just looks so damn good :) No, it won't work too well on 1:9 20" barrel but still. Brake used in this test was homemade copy of F2 by handy fellow shooter with lathe, Dremel, drill and file. Yep, you read it right! 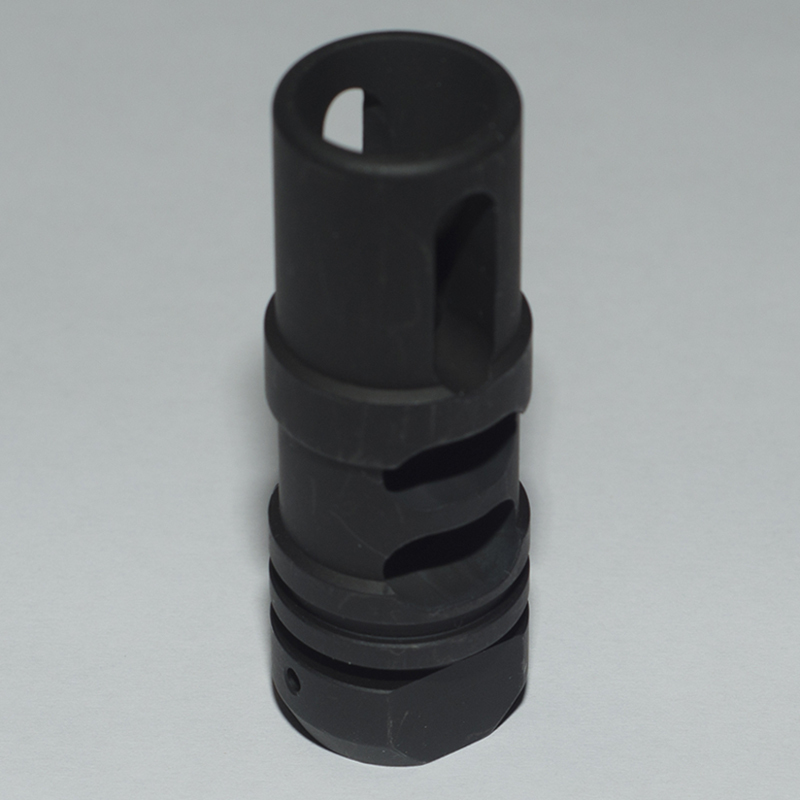 It has three relatively large chambers and two upward facing compensation holes. So what did we found out? 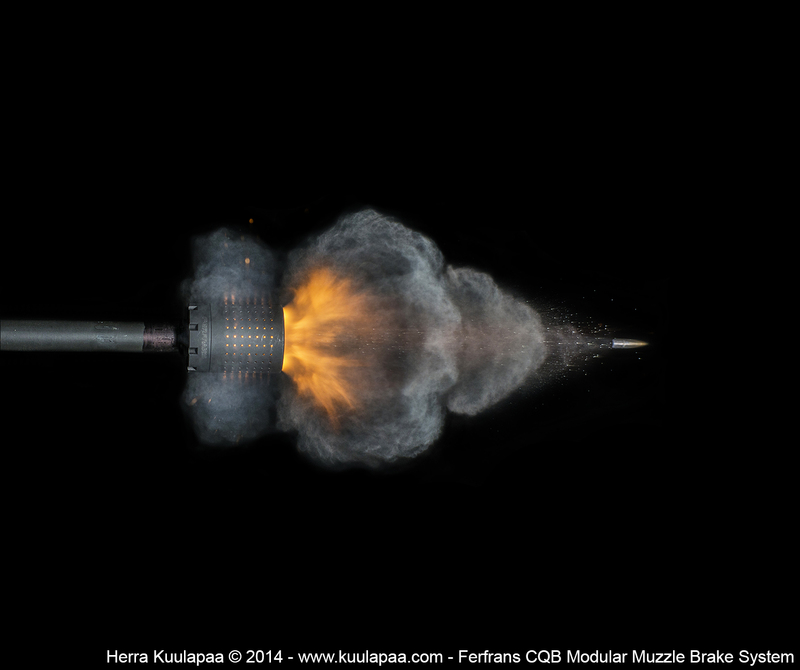 Pretty much good enough visual explanation why AR-15 with brake feels so good compared to unbraked one. 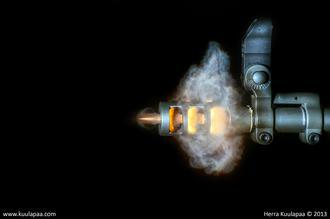 There isn't actually much gas following bullet already exited brake, which brings silencer tests to mind. 5.56 NATO round is high pressure cartridge and recoil is caused by high velocity gasses escaping barrel forwards. When these gasses are directed to both sides this back driven force is greatly decreased. In this case it practically ceases to exist. 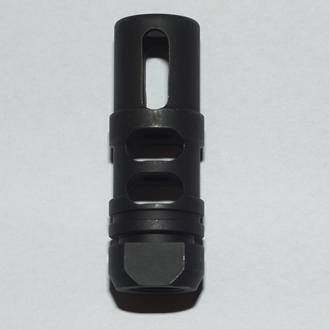 There is of course effect of bolt carrier and spring like every AR-shooter knows but otherwise it just makes loud noise. 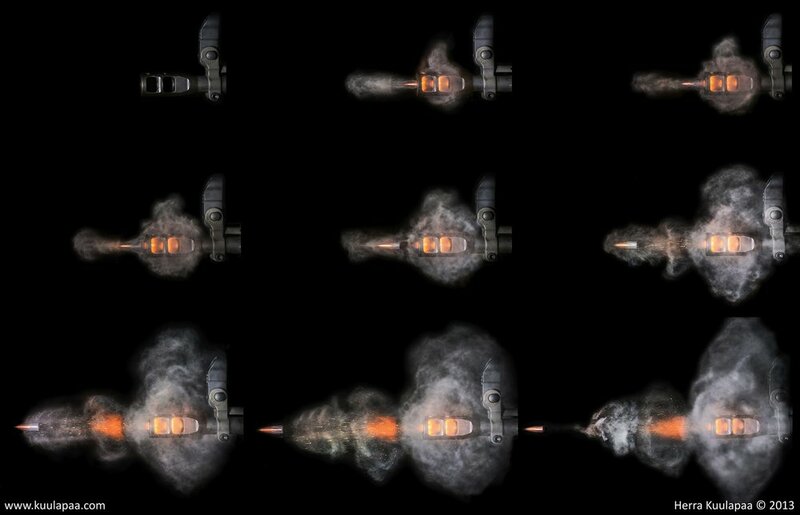 It has been argued whether two chamber brake is as effective as three chamber one but although these images won't give you clear picture what is happening I'd estimate that there is enough gas left in third chamber to have effect from it too. In future it would be interesting to take pictures from above to show how gas is really flowing. There is reason for additional tests then. Enjoy images and remember to click them big! Here is small extension to .308 images below. 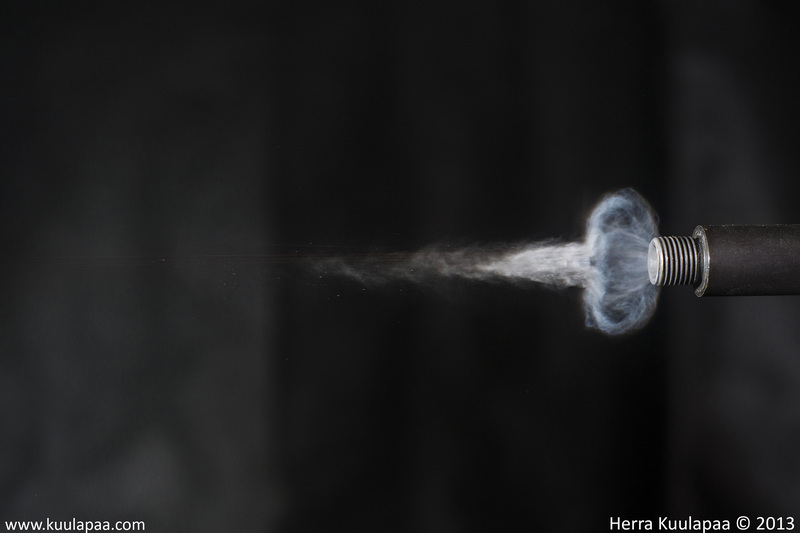 This is a high sensitivity image of 147grs FMJ .308 bullet in flight and what is interesting you can see supersonic bubble pressure wave in there. 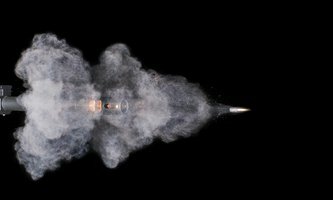 Bubble however is not pressure wave caused by supersonic bullet but high velocity gas “explosion front” released after bullet from barrel. 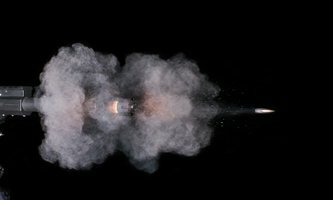 It is much better visible than sharper cone type bullet wave, which can be barely spotted in picture if you know where to find it. It is so weak though that seeing it requires some imagination but there it is and it can be found through image processing. I try to get better picture of bullet wave later. 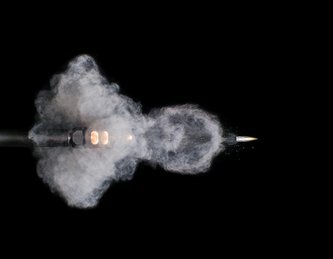 Enough with small calibers already. Let's switch to bigger, faster and stronger. 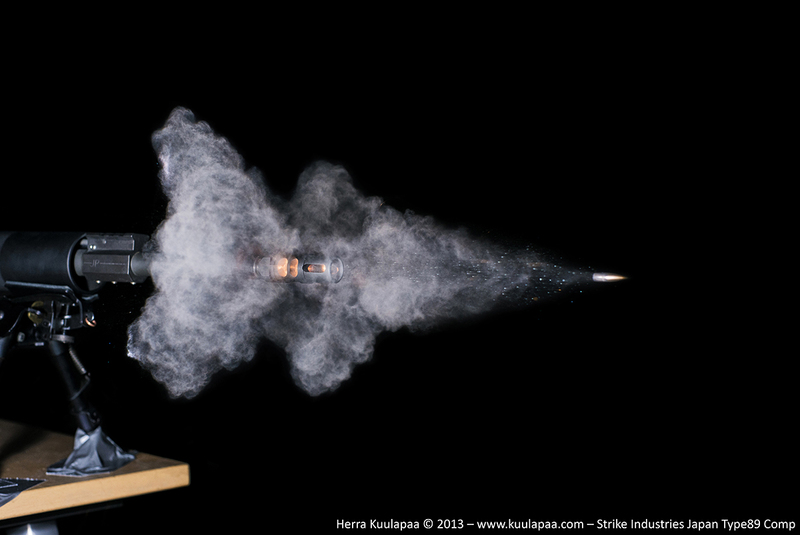 So here is high speed photography image series of .308. Rifle was Sako Forester with track record 50+ moose. Impressive gun I must say. 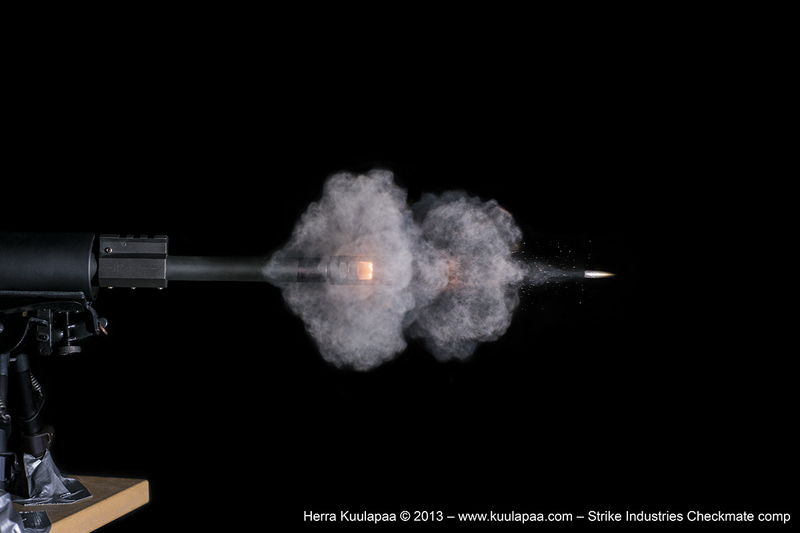 Ammunition used was Sellier&Bellot 9,55 g (147 grs) FMJ with muzzle velocity 850 m/s (2800 fps). 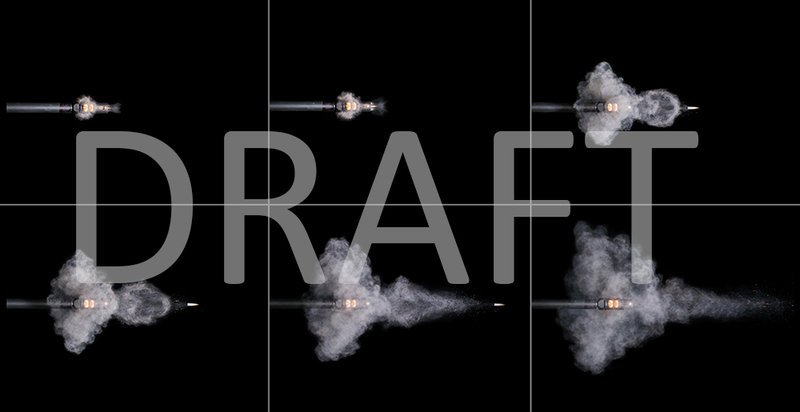 With quick glance pictures look almost same with smaller rifle pictures but then picture scale comes to mind. We're in very different league now. 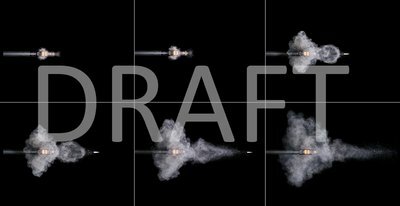 Series has been taken on different shots and bullet position has been adjusted few centimeters in each shot. 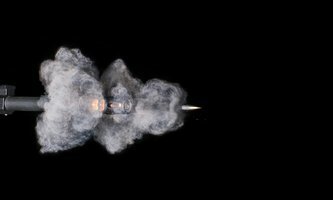 Speed of the bullet is approx one centimeter per 10 microseconds. It's one fast son of a gun. 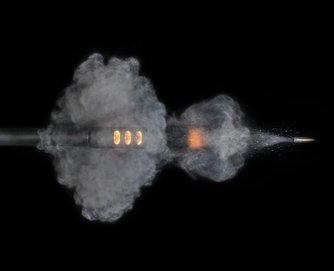 When you look pictures you can immediately see amount of gas and pressure released after bullet has left barrel. 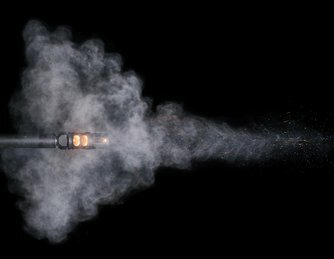 Bullet is in middle of gas cloud for first 40 cm (1 1/2 feet). Pressure is also so great that I managed to damage my camera and it went to repairs. Word of warning, it may not be wise to photograph high power guns so close. 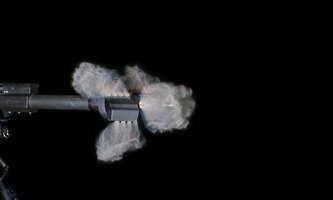 Below you can see one picture of bullet just leaving the barrel. 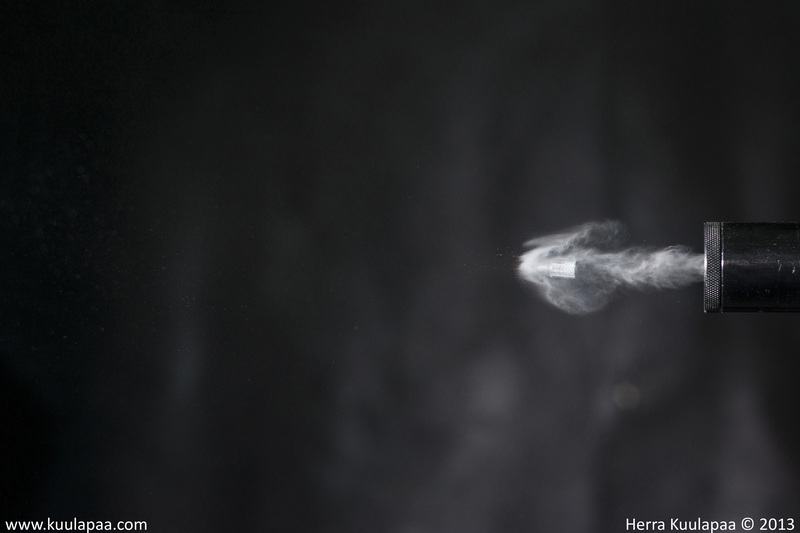 There is so violent burst of high pressure gas pouring behind that bullet is almost lost in cloud. 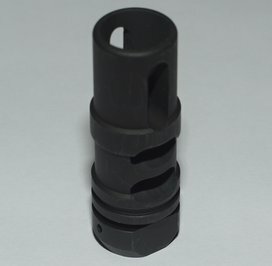 I'm happy to present you a .22lr suppressor/silencer comparison to plain barrel. 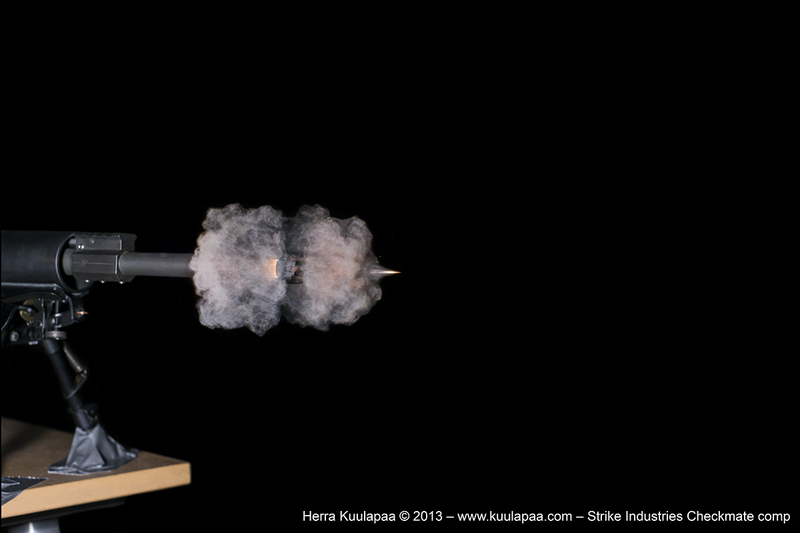 In this test I used cheap suppressor, which uses simple chambers without any clear gas reflecting baffles. For .22lr I've found this adequate structure. 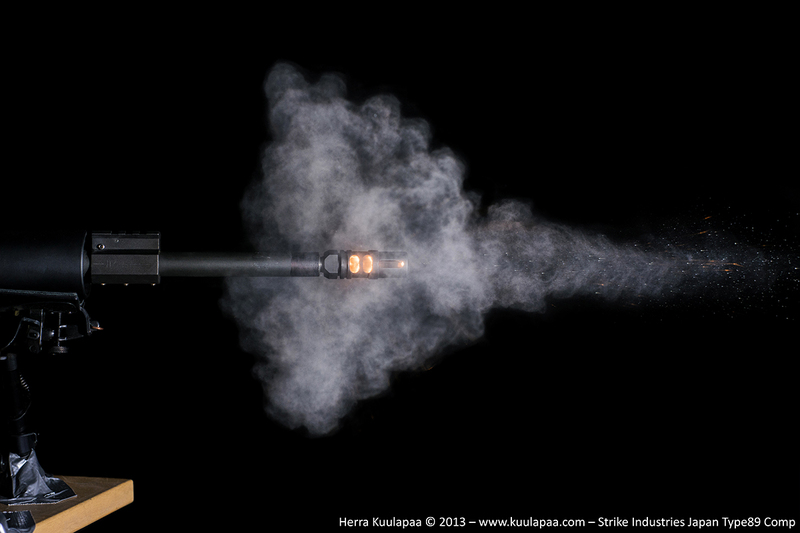 With high pressure rifle calibers proper suppressors like BR-reflex are really effective. This is part one and more comparisons will follow. 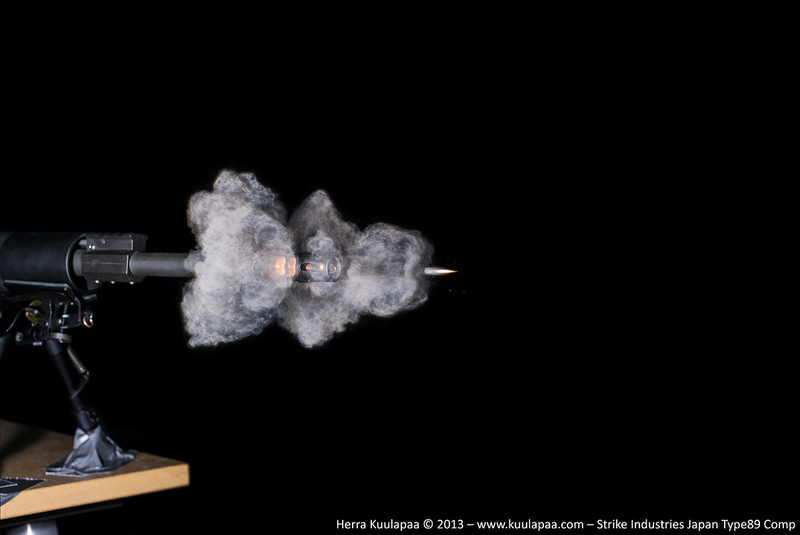 At least it is my intention to do .223Rem suppressor test as well. I've noticed some color fluctuation of pictures, which hopefully aren't warning of coming component failure. At least everything works fine, so far. Let's get into subject. Instead of trying to explain things verbally it's easier to present findings as images and leave final interpretation and enjoying of images to you. 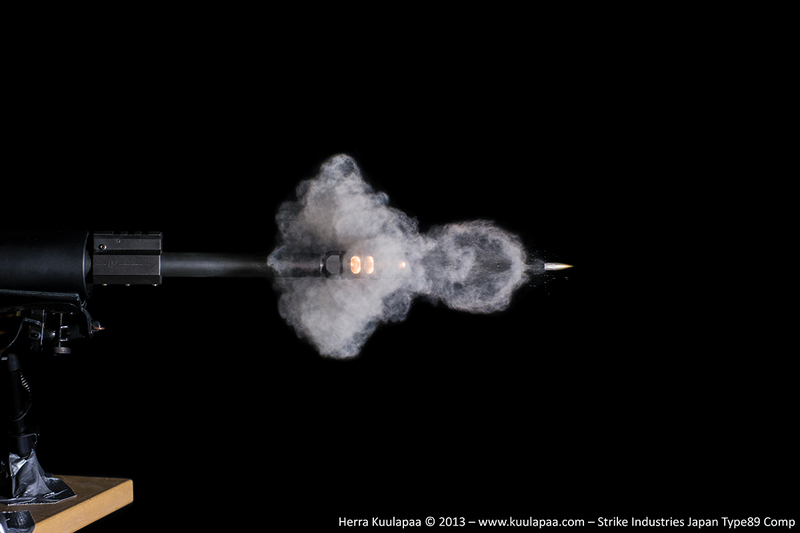 Above is picture series without silencer and below is silenced one. 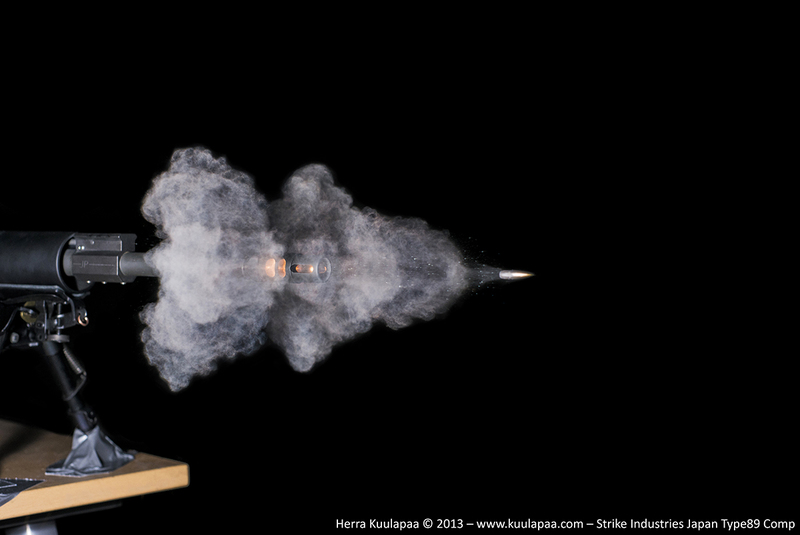 Both series show pre wave gas flowing out in front of the bullet but difference comes after the bullet. 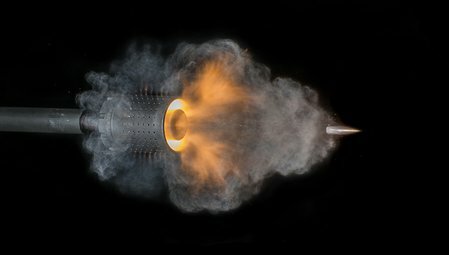 Middle picture above shows high pressure gas bubble forming after bullet has left barrel and no longer acts as plug holding back high pressure gas. 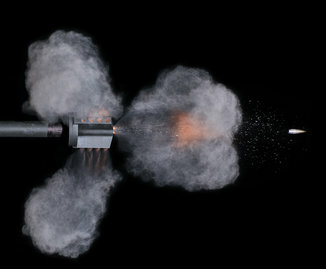 This creates typical gun shot bang (in addition to supersonic bullet sound). 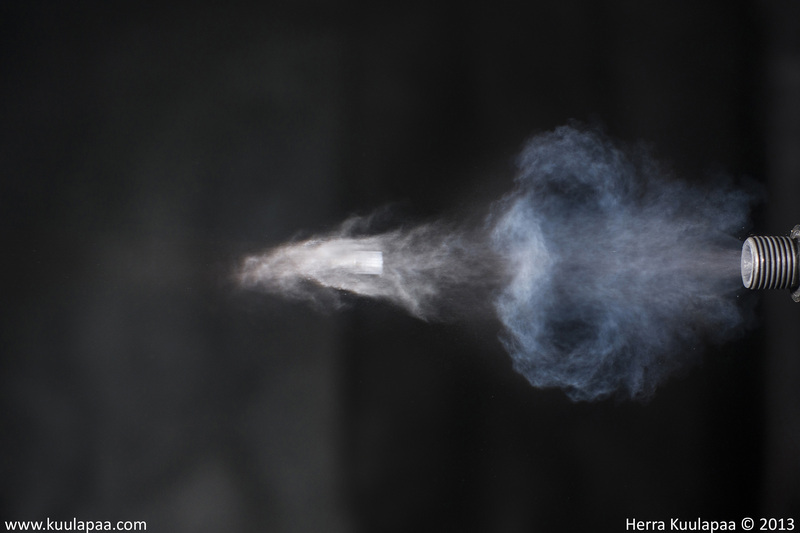 With suppressor that same high pressure bubble has already formed but inside of the tube, which distributes gas between suppressor chambers and allows gas to expand in controlled manner. 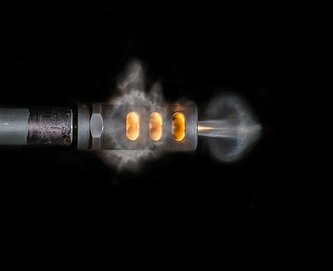 When gas finally flows out of the suppressor its speed has decreased. 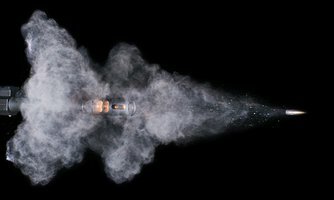 There is no bubble formation with suppressor and typical gun shot bang. 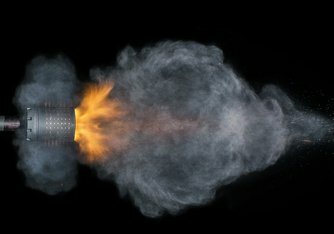 Well, to be honest once again I must say that even .22lr makes such loud noise indoors and in defined space that you really want to cover your ears. 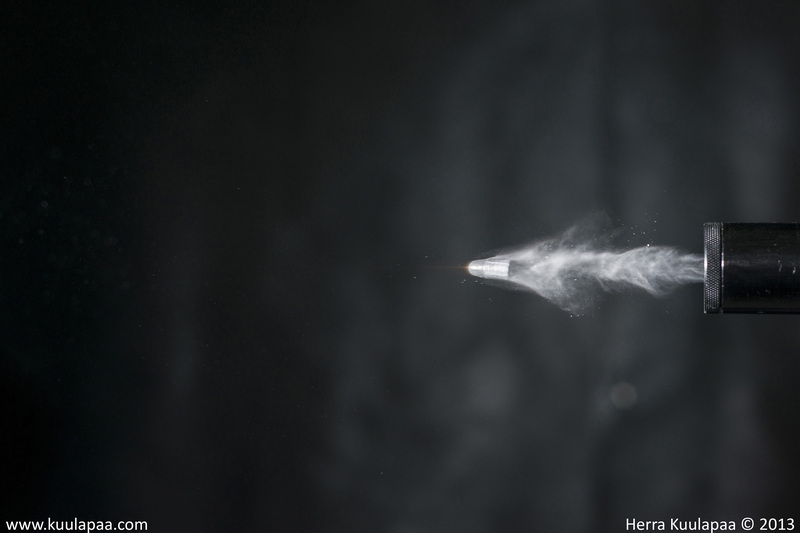 In open space noise is dispersed and what matters is nature of the bullet (sub- or supersonic).